Sur l’écran de la mémoire, en noir et blanc. Obscurity is a determining factor in the music and life of Ran Blake, a musician passionate about cinema. 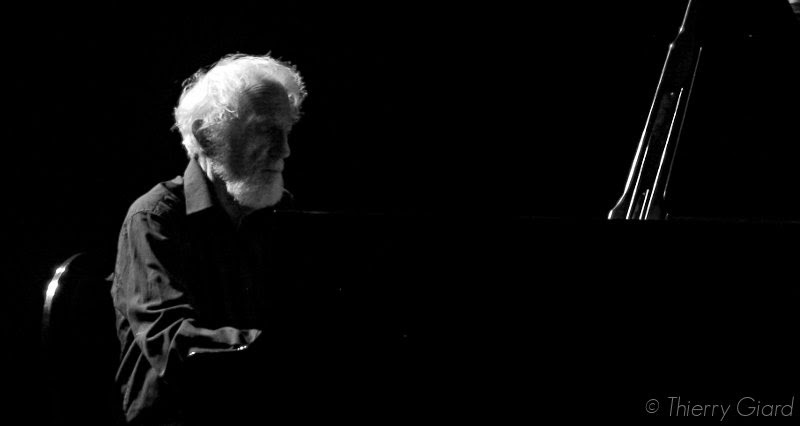 There will therefore not be much light to see the pianist in the shadows with his beard and white hair, walking with difficulty to the piano but miraculously re-finding all his creative energy once his wrists start moving and his fingers touch the keyboard. Just then we can measure the importance of the moment. In the intimate space of the small auditorium at the Caen Conservatory, we had before us, who played for no one but us, a piano legend, his jazz music which he plays most nobly, a serious music, both popular and art music. The first morsel of Ran’s discography was titled “The Newest Sound Around”, the most innovative sounds of his period – that was in 1962. He expresses himself in a style that sharp but contrasting (which he still uses today) for a dialogue with the singer Jeanne Lee. On this evening in May 2017, the voice and the singers in particular remain at the center of his obsessions. All through the concert, he brought up the ghosts of Billie Holiday, Abbey Lincoln, Chris Connor, Mahalia Jackson as well as Ray Charles and Nat King Cole. Behind his black sunglasses, we feel that he sees them all around him. This man is haunted by their images and his own piano accompaniment, give life and sense to his interior monologue/narrative. The freedom of his interpretation is immense and yet, as in serious musical concerts even if not classical, the listener receives the program at the entrance. We know therefore mostly what the player-creator intends to do. From the beginning, all was serious. There would be the question of racism and fighting. The piano violent, then tender, caustic and finally joined with optimism through Strange Fruit, the Fables of Faubus of Mingus and some allusions to popular music (John Brown’s Body). Just after were the standards playing on the dreamscreen of Ran Blake, a storyteller that cultivates art from ellipses and filled in silences. Not all is said, told in detail, but stones in a mosaic to guide the listener and help follow a splendid and sonorous musical path, unknown and familiar at the same time, poetic, melodious, and always totally modern. A surprising start to the second half, Ran Blake returned accompanied by Lukas Papenfusscline, one of his students, his assistant who is also even his life’s auxiliary. The disciple sang magnificently and accompanied himself on the piano. The master was right next to him, watching over, completely concentrated, encouraging his audacious traits. The life of his movie continued. Next, standing by the piano, the singer-speaker conversed with Ran on a song from Max Roach (Mendacity) and it was once again “The Newest Sound Around” that we were hearing, fascinated. When his valet left, the master took up with an adventure into the delicacies of Abbey Lincoln’s universe (Throw it Away, the Music is the Magic, Caged Bird). Ran Blake does not spare the listener, but neither does he agrees them, on the contrary, but he obliges a sort of constant attention. There is a real need for it in the atmosphere, but it is also a true please to listen actively. There isn’t much to see other than a frail bearded shadow with white hair in the near darkness. Nothing to see, but a rare musical world to discover with intelligent listening. A big musical lesson!